Will be the first point of contact when you need help in the Service Transformation Centre. 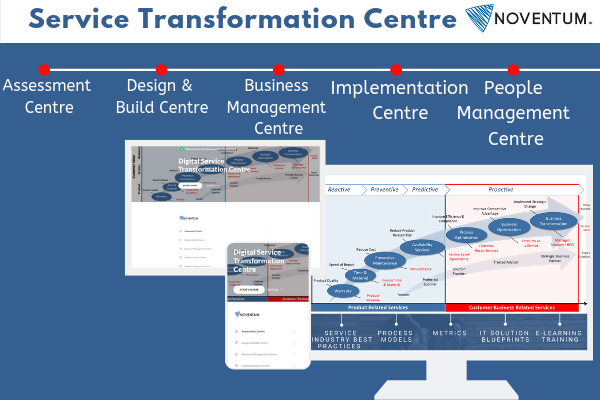 The coach can guide you through your Service Transformation journey and will help to solve your challenges while facilitating the use of all the best practices and tools that are provided in the Service Transformation Centre. Develop your leadership skills and successfully transform into a digital service business that focuses on improving the value of its customers. Why is Noventum offering the Service Transformation Centre? Noventum has been working the past two decades with a lot of large multi-national companies that needed to grow and improve their service business. Over the years of running service transformation projects we discovered that most service businesses use similar Service Management Practices, Process Models, Roles and Organisation Designs, Performance Metrics, Solution Requirements, Service Solution Blueprints, and E-Learning training courses no matter the industry they are in or technology platform they sell.